This archive holds all posts form February 3, 2011. Greensboro, North Carolina, is considered the birthplace of the student lunch counter sit-ins of the early-1960s. This Tuesday marked the 51st anniversary of the proactive step planned and enacted by four African American male freshmen students at historically black North Carolina A&T State University on February 1, 1960, to sit resolutely in protest at the whites-only lunch counter at Woolworth’s, one of the city’s prominent five-and-dime stores. The “Greensboro Four” were Joseph McNeil, Franklin McCain, Ezell Blair, Jr. (later, Jibreel Khazan), and David Richmond, and a statue of them walking resolutely, shoulder-to-shoulder, has for 10 years now been displayed on NC A&T’s campus. Greensboro was not the first site of African American’s sit-in protests against whites-only public facilities; accounts of similar actions reach back decades prior. Nevertheless, the action by McNeil, McCain, Blair, Richmond, and the hundreds of other students who joined them in subsequent days, inspired a rapid implementation of sit-in protests throughout the segregated South within a matter of weeks. After nearly five months of strong resistance to let go of “local custom,” the white management of the Greensboro Woolworth’s finally caved and served its first seated black lunch counter customers (ironically, its own employees) on July 25, 1960. February 1, 1960 was a historic moment in the American – and global – human rights story. And it is the sit-ins alone that make Greensboro a memorable city in the American consciousness. 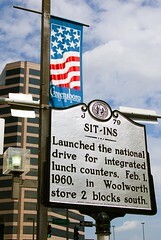 Many Greensboro citizens, especially African Americans, have embraced this identity of their city as the birthplace of the sit-ins, and this recognition led to the renovation of the original downtown Woolworth’s store into the International Civil Rights Center and Museum, which opened in 2010 in conjunction with the 50th anniversary celebration. For my dissertation, I wanted to investigate how ordinary white people recall the racial past, so I came to a city known for its racial history. I’ve been living in Greensboro for a few years and have conducted in-depth interviews with dozens of lifetime white residents of the city, people old enough to have lived through Jim Crow segregation and the civil rights era. They didn’t make any fuss or anything. They just got together and they just ambled in to Woolworth’s and asked to be served. Saying that protestors “just got together” and “just ambled in” portrays their organizing as spontaneous, the implementation lackadaisical, and the backlash as insignificant. Virtually no one indicated that many white business owners fought hard, for months in many cases, to maintain segregation policies. Had I been born black, I would’ve protested before they did. I would have. I have never understood how they had the patience as long as they did. While acknowledging the inherent unfairness of segregation practices, this woman belittled those who she thinks waited much longer to act than her fictitious black self would have. In these ways and more, the older white lifetime residents of Greensboro I interviewed demonstrated that they had not accepted their city as an important site of Civil Rights Movement activism. To fully embrace that identity, they would have to redefine themselves and loose their grasp on this belief that (white) Greensboro had for centuries been “good to the blacks,” a diamond in the rough city that the rest of the region and nation could hold up as a model of racial progressiveness. Wife: That museum should be on the campus of A&T, where the students came from, not in downtown Greensboro. . . . And I’m not against the museum . . . but it should be down on the campus where the A&T students were, and have it as a commemoration to them. Husband: Isn’t that statue of the four down on campus? Me: Mm-hm. Wife: You see, put the museum down there with that. Me: Do you have any pride that the sit-ins happened here. Wife: No. Me: and that they started sit-ins all over the South? Wife: I thought it really started out in Omaha, Nebraska, is what I heard and that they did not get the publicity Greensboro got. That’s what I’ve heard. Now I don’t know how true that is. I’ve tried to look it up on the computer, and I hadn’t been able to trace . . . No, I’m not proud of that, no. No, we have other things to be proud of. O’Henry was born here, Dolley Madison was born here. Okay? Yes, Edward R. Murrow was born here. We are very proud of those citizens, absolutely. I admire these four young men that took the initiative for the sit-in. I admire their courage for it. Husband: Took a lot of guts. Wife: but these other people are to be admired more for what they did and the legacy that they have left for us. Wife: Well, Dolley Madison was the wife of our fourth President! And she was born out here near Guilford College. So Dolley was quite a lady. O’Henry is known for his short stories. They’ve been translated into many, many, many foreign languages, and he was born here outside of Greensboro. Edward R. Murrow, who was the leading commentator and correspondent during the Second World War, he was born here in Greensboro. These are the people that really accomplished an awful lot. We had other people that accomplished things. We had another black man who did an awful lot for the city of Greensboro, Charles Henry Moore, who is not very well known, but he was a teacher and professor at the colleges here. He was instrumental in getting Bennett College established in Greensboro. He was instrumental in raising money for the black hospital, L. Richardson Hospital. He opened the door for a lot of the blacks and unfortunately he is not remembered like these other people, but he contributed a lot to improve their way of life. This woman argued that Greensboro’s sit-ins should not be commemorated because she “heard” they began elsewhere first, and, if commemorations are designed, they should be sequestered on the campus of NC A&T. She refused to view civil rights actions as a movement that significantly improved African Americans’ “way of life” or left a “legacy” for the city and beyond. In my research I have found that a great many whites today are unable or unwilling to extend genuine respect and admiration for African Americans, especially activists from civil rights and post-civil rights eras. They refuse to acknowledge that black Americans have contributed, perhaps more than anyone else, to the expansion of our most dearly-held American values of “liberty and justice” and that these gains have benefited all citizens, including whites. In rejecting the reality that the Jim Crow society whites had formed was inherently unjust, they can continue to deem whites as virtuous and African Americans as second-class citizens. It continues to be a radical act to challenge white racism openly in the U.S.A. And, unfortunately, it is also a radical act to commemorate those moments in our history that exposed and weakened the contradictions between our American pride and our American racism. Let us continue, in the spirit of February One, to be radical by remembering well and taking collective action.